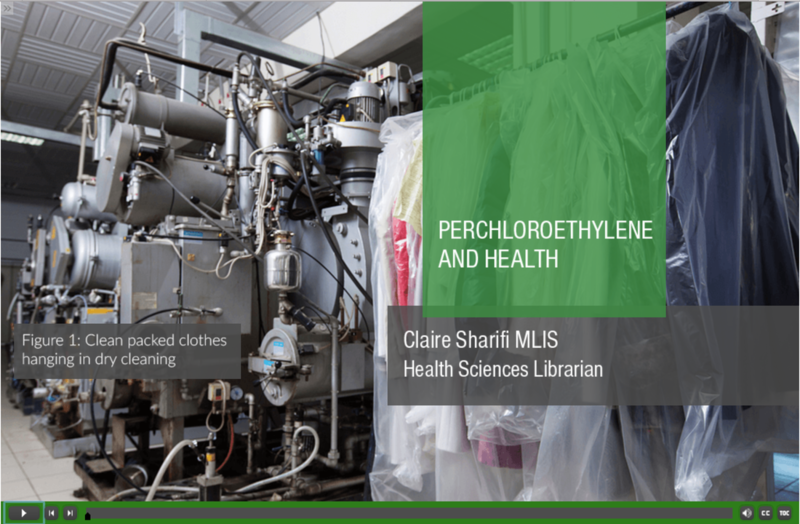 ﻿This lecture provides instruction on using National Library of Medicine resources to find information on the chemical perchloroethylene and health effects of exposure to perchloroethylene. Specifically, this lecture introduces viewers to TOXNET, Toxline, and HazMap. 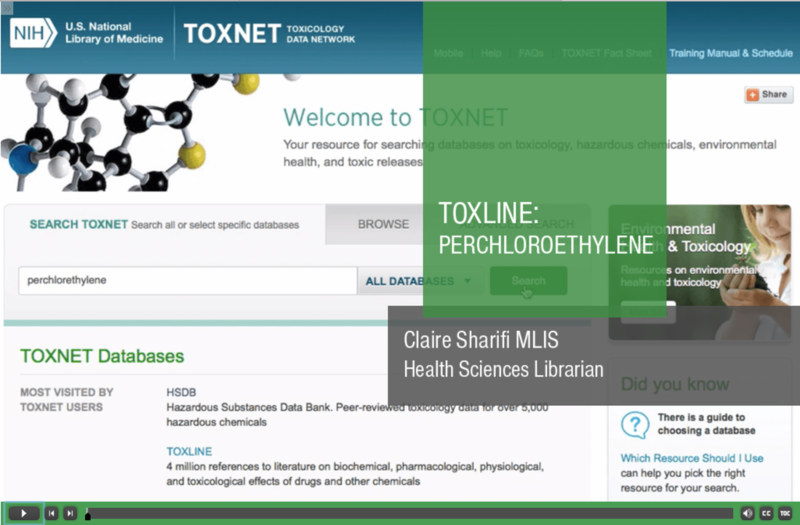 Specific resources discussed include TOXNET, Haz-Map, and Toxline. From The National Institute for Occupational Safety and Health (NIOSH). 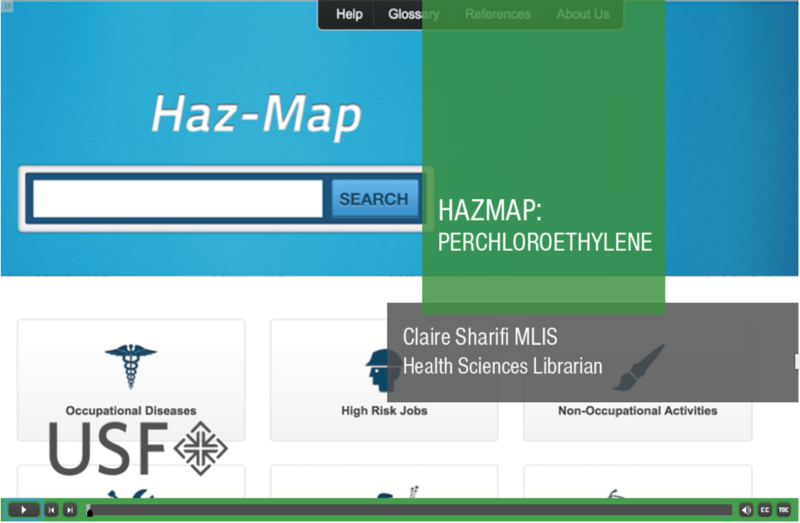 The NIOSH Pocket Guide to Chemical Hazards provides industrial hygiene information for workers, employers, and occupational health professionals. National Library of Medicine. Consumer/patient health information on Perchloroethylene from Tox Town. From United States Department of Labor, Occupational Safety & Health Administration. General information on dry cleaning safety for employees, includes guidance on reducing perc exposure for employees. From United States Department of Labor, Occupational Safety & Health Administration. A toolkit for employers and workers on transitioning to safer chemicals. Take a walk through your neighborhood or community and observe the number of dry cleaners. Are they near apartments or food stores? Are there any green or environmentally friendly dry cleaners? What is the perc "footprint" in your community?